This month the fifth annual Big Rhône Tasting took place once again in the atmospheric cellars of Ely Bar & Brasserie in the CHQ. For the uninitiated, the Rhône is a famous winemaking valley in the south of France and, yes, this two hour evening event involved lots and lots of wines from this very region: over 120 wines from 15 independent Irish wine importers to be exact. But ask a regular wine drinker to explain what grapes are used in Rhône wines and you’ll probably be greeted by a blank look (it’s mostly Syrah or Grenache, or both). To ask them to explain the difference between the 120 wines on offer and you’ll most likely be greeted with silence. This is the crux that the wine industry has been agonising over for the last number of years. The industry is infamously fragmented, with very few brands successfully achieving the holy grail of unprompted consumer recall – and even then those brands may be relying on gimmicks, such as attaching trinkets to the necks of bottles, using animals on the labels, or more bluntly via sheer price-driven promotions. In the past, wine branding was relatively straight-forward: in an age where market noise was quieter and establishing brands was somewhat easier, the likes of Blue Nun, Mateus and Black Tower reigned supreme. But today, in an effort to differentiate, almost every drinks retailer has a different and almost mutually exclusive range of wines, which in turn are completely different to those found in restaurants and bars. The result is a tyranny of choice. Instead of a grand democratisation of taste, the expansive wine selections we now have in Ireland have resulted in dazed and confused consumers buying almost entirely on price promotion, prejudice, or caprice. The ‘new world’ wines – such as those from Australia and Chile – have made some ground in consumer brand awareness, thanks to their clear labelling in English, but the ‘old world’ wines from Europe persistently suffer from consumer confusion. This task is made significantly less easy by the fact that ‘old world’ wines tend not to state on the front label what grapes they’re made from, or indeed what general region or even country they’re sourced from. Instead – using the Big Rhône Tasting as an example – what you’ll see are names of apparently unrelated regions and villages: Châteauneuf-du-Pape, Gigondas, Luberon, Ventoux, Vacqueyras, Côte Rôtie, Crozes-Hermitage and St-Joseph, amongst others. Not one of them says anything as clear and straightforward as “Rhône Syrah”. So how, then, to communicate effectively in a field full of apparently similar and undifferentiated offerings? Earlier this year the UK branch of Inter-Rhône, the body responsible for promoting Rhône wines, released a humorous set of advertisements that used “Franglais” – a mash-up of French and English – in their copy. Each was rendered in a hand-painted, vibrant, retro nod to Francophone posters of old, with witty taglines such as “Un Superb Rouge Pour Getting the Girls Around”. Though it had its detractors, the campaign was warmly received, especially by the wine media tired of the same clichéd campaigns involving dusty bottles, grand estates, superlative plaudits and generic pictures of indistinct wine bottles. Yet the latter format of wine communication still persists, despite its obvious shortcomings: they fail to engage consumers, speak to them about the qualities of the wine, its differentiation, or why they should purchase them over any of their competitors. We don’t see this problem whatsoever in any other form of alcohol communications: beer and spirits brands are extremely adept at conveying their core brand values and USPs. Ask anyone to name a beer and they’ll instantly say Guinness, Heineken, or Carlsberg; for whiskey they’ll likely say Jameson; for vodka it would be Smirnoff or Absolut. But ask them to name a popular wine? The most likely response is going to be “something on offer from Tesco”. Even the Inter-Rhône ads missed a trick in that the product they were selling – the generic Côtes du Rhône region – was in small type at the bottom of the posters. 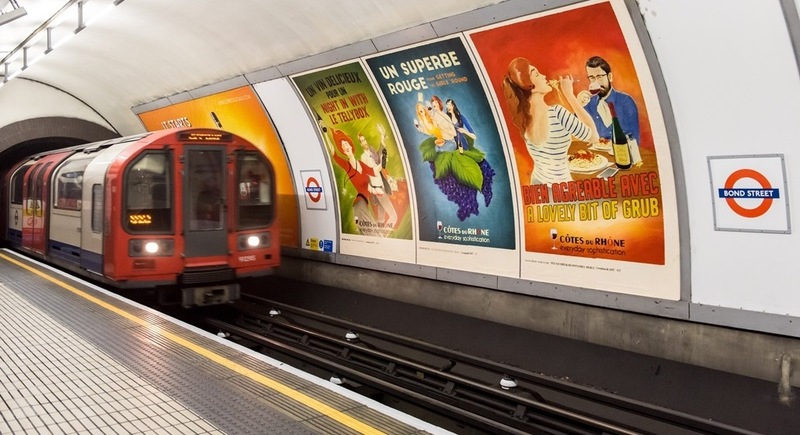 On first glance they were humorous ads about wine – ask anyone in the Tube stations what wine they’re about and you’ll once again get that blank face. And even if consumers did walk away remembering the name “Côtes du Rhône”, when they walk into a shop or wine bar and seek a Côtes du Rhône wine, they are likely to be presented with a wine by any of hundreds of producers, with significant variations in quality and style. And there’s the Catch-22: the individual producers don’t have the money to promote their own brands, and the trade bodies are too generic to have a significant impact. So is there a solution to this? Many tens of millions have been spent by wine brands and trade organisations around the world to answer this very problem, and, for now, at least, it looks like money ill-spent. Wine is a very old and inert industry with a messy history, complicated laws, and intricate webs of vested interests. It spans mega brands such as Santa Rita to mom-and-pop operations that are literally run from their rural barns, and production centres are fixed – you can’t make French wine in Italy, but you can make Guinness or Smirnoff anywhere in the world. For businesses and brands today there is a lesson to be learned, however. Though the problems with wine outlined above are by now entrenched and intractable, it shows that a strong, established, and centralised message is crucial to ensuring effective reception and recall, since multiple differing messages from an array of actors can only lead to confusion and complication.